Ever wanted to synchronize your Mac with devices and accounts? In this case you know that there are only a few really great apps that can synchronize data between your Mac and mobile devices, tablets, online accounts. We mean really syncing with Mac apps like iCal, Address Book, iTunes, Photos, not just transferring files between folders on Mac and device. Below is the list of 7 best (according to our testing) apps that can synchronize data on your Mac with different devices and accounts. We’ve tested online apps as well as offline solutions. The first app in our list is SyncMate. Rather handy and multi-optional utility that can synchronize Mac with online accounts as well as with phones, tablets, portable devices. What can you synchronize Mac with? Android phones or tablets, iOS devices, other Mac computers, MTP and mounted devices. Online accounts are also supported: iCloud, Dropbox, Google. Still not enough? Windows services are also supported - Outlook, Office 365 Home and Business accounts (sync with OneDrive). Sync options. The list of sync options impresses as well as the list of devices you can synchronize Mac with. Starting from personal data to media files and folders SyncMate offers several non-sync options like device mounting, SMS management and others. Our thoughts. SyncMate is one of the most feature-rich app in this list and the only one that can synchronize data on numerous devices and accounts with Mac apps (iCal, Address Book, iTunes, etc.) directly without the necessity of using cloud sync. GoodSync is a nice piece of software that offers both - synchronization as well as backup/restore. What can you synchronize Mac with? GoodSync supports syncing with any computer, drive or mobile device. Backup options are available for these devices as well. You can sync files between your computer, mobile devices, FTP, SFTP, Amazon S3, Google Drive, SkyDrive, WebDAV, Azure. You can back up data to portable drives, mobile devices and to FTP, S3, Google Docs, SkyDrive, DAV or another computer. Sync options. The range of sync options is rather poor, you can sync folders with files only. Note that sync is performed only between a pair of folders, not between folder and Mac app (iTunes, Photos). Our thoughts.. GoodSync turns to be not a very flexible sync tool. It offers a wide list of supported devices, but allows syncing folders only; has no interaction with built-in Mac apps. 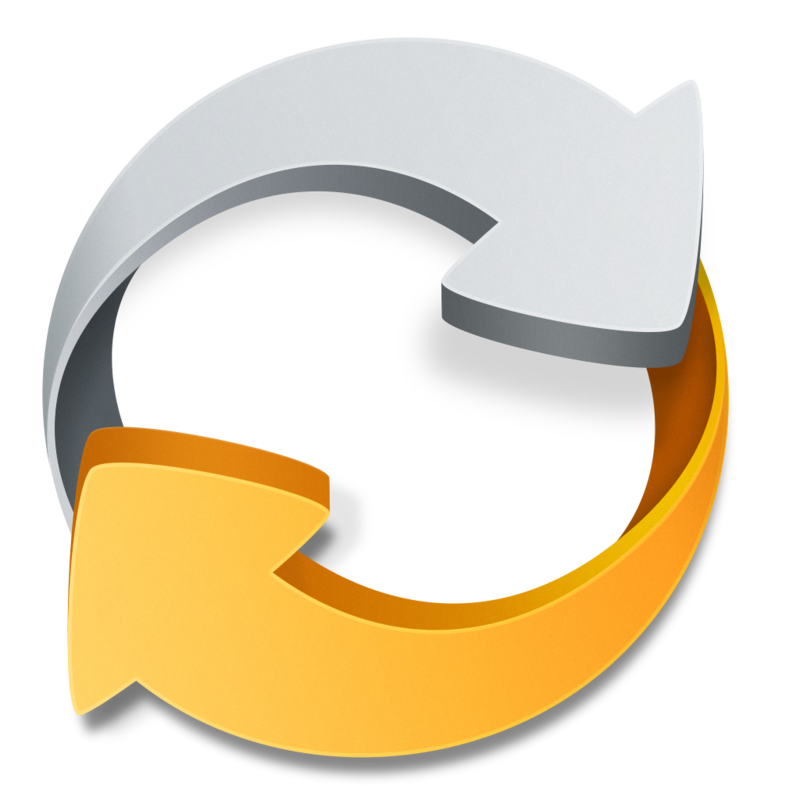 ChronoSync, the third app in our list, offers backup and restore options as well as syncing. What can you synchronize Mac with? Can’t say that the list of supported devices impresses a lot - you can sync with Mac computers and iOS devices only, syncing with other non-Apple devices or accounts is not supported. Sync options. Unlike the list of supported devices, the list of data you can sync using ChronoSync is rather wide. You can synchronize any type of files between Apple devices: media files or documents. Unfortunately, contacts or calendars sync is not supported. Besides syncing, ChronoSynс offers a wide range of backup options - local backup, remote backup, bootable backup, remote bootable backup. Our thoughts. Not bad if you need to synchronize Mac with Apple devices only (which in fact can be synced without any third-party apps). The main disadvantage is not being able to sync personal data. Synchronize! PRO claims to be a sync tool, while in reality it is a backup/restore tool. Let’s take a closer look. What can you synchronize Mac with? The list of supported devices is rather wide. Synchronize! PRO allows backing up data on Mac to file server, or your PowerBook, or a FireWire disk, so that the files on both are up-to-date. You can even make a bootable backup to a disk image over a network. Sync options. In case of Synchronize! PRO it would be more correct to name this section Backup options. The list of backup options is not too rich - you can back up personal data and folders with files. Synchronize! PRO also backs up your OS X startup disk to another hard disk, so that the backup disk is bootable. You can run your backups automatically or schedule them. Our thoughts. Synchronize! PRO is great for backing up and restoring, but if you need your data to be synced, this app won’t help. For those of you who likes storing data in a cloud, below are 3 services that can sync and store data there. The main advantage of these tools is that you can access your data from any device provided that this device is connected to Internet. Among the disadvantages is that not all of them offer interaction with Mac apps or allow storing and syncing personal data like contacts and calendars. iCloud is a native cloud storage for Apple devices. Allows not only storing data in a cloud, but also managing personal data in iCal, Address Book, Reminders, etc. directly in iCloud account. Dropbox is probably the most popular and reliable cloud storage for now. Dropbox offers cloud space for free and allows storing folders with any files there. One of the main Dropbox advantages is that you can share data you have in it with other people (even if they are not registered in Dropbox). Available for Mac, PC, iOS and Android. Just like Dropbox SugarSync provides you with a cloud storage where you can transfer files and folders. Allows sharing the content you have in SugarSync storage; removing all synchronized files from a PC or Mac in the event of loss or theft. Available for Mac, PC, iOS and Android.